When the Government crafts a package of tax reform its options will be limited by two big constraints. One is fiscal: the self-imposed need for the package to be broadly revenue-neutral overall, which inevitably means it is an exercise in robbing Peter to pay Paul The other is the need for it to be seen as reasonably fair and equitable. R-I-G-H-T. Let's have a wee kick around on this shall we? The Tax Working group, made up of rich old white men have decided to lower the tax rates on the wealthy by increasing GST. Huh? The argument being used is that rich people put their money in trusts and actually end up paying much lower rates of tax, SO we need to lower the tax threshold and increase GST for all of us to make the change 'neutral'. Ummmmmmmm - how about another idea, how about we raise the tax on trusts rather than lower the tax rate altogether? How can an argument which is "Hey 100 of the richest NZers dodge tax via trusts, so let's make everyone else pay 2.5% more in GST' stand up? Oh, let me guess, how many of the all white rich male tax working party have trusts? While we are talking economy - isn't it nice that the Government won't release the number of NZers unemployed as a percentage now we are getting close to breaching the 7% threshold our merchant banking John Key said he was optimistic we wouldn't go over? The number of people on the dole rose 13 per cent in December and the Government says it will keep rising. There were 66,328 people receiving the unemployment benefit at the end of December, up from 58,541 in November. It is more than twice the number of December 2008. Perhaps these 2500 people lining up for 150 jobs hadn't heard that the recession was over? The double dip recession is only starting, just because NZers have had plenty of sun over the Summer doesn't mean all the problems disappeared, simply being optimistic for the sake of positivity is more akin to a plot line in 'The Office' than a strategy for running the country. John Key's aspiration is looking more and more like an empty spin line. 38% over 70K is overtaxing. 70K isn't 'rich'. Don't get me wrong, its ok money, but hardly the realm of the weathly. Hmmm, as The Standard points out when you break down tax the supposed cost for the rich is pretty low - Someone on $50,000, who earns more than 79% of Kiwis, isn’t paying 33% of their income in tax. They pay 33% on just $2,000 of income, they pay 21% on $34,000, and just 12.5% (thanks to Labour’s tax cuts) on the first $14,000. Their total tax bill is $9,550 – just 19% of their gross income. 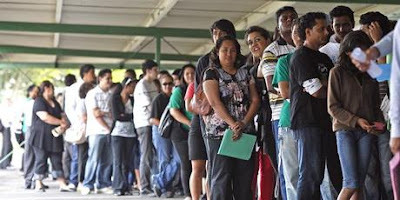 The number of people on the dole rose 13 per cent in December and the Government says it will keep rising. There were 66,328 people receiving the unemployment benefit at the end of December, up from 58,541 in November. It is more than twice the number of December 2008. Social Development Minister Paula Bennett said it reflected the yearly influx of school leavers and tertiary students competing for jobs. THOSE PEOPLE IN THE LINE FOR MENIAL MUNDANE BORING REPETITIVE TASKS USUALLY RESERVED FOR SPECIAL NEEDS KIWIS AND I DO MEAN SPECIAL NEEDS PARTIALLY INTELLECTUALLY HANDICAPPED DON'T NEED THIS AMOUNT OF UNFAIR COMPETITION FOR THE JOBS THEY DO. THE AMOUNT THE DOLE WENT UP ON THE E.U.B IS UNDER 10,000 OUT OF A TOTAL OF 74,000 FOREIGN STUDENTS.WHAT DO THE REST DO FLY HOME FOR SUMMER? ALL BENEFITS ACROSS THE TASMAN NEED TO BE RESTORED STRAIGHT AWAY UPON ARRIVAL. as for jobs student job space website wasn't even up and running when i looked last apart from jobs in south africa, doing everything online is a near impossibility for students looking for some ready cash of a couple of hours labouring on a saturday morning and all they need is for them to put the phone numbers to contact employers on the student job search website and open it up to "the unemployed". Someone on $50,000, who earns more than 79% of Kiwis, isn’t paying 33% of their income in tax. They pay 33% on just $2,000 of income, they pay 21% on $34,000, and just 12.5% (thanks to Labour’s tax cuts) on the first $14,000. Their total tax bill is $9,550 – just 19% of their gross income. THEY SHOULD PAY THE TOP ON THE WHOLE LOT OTHERWISE ITS A TAX DODGE.OR IS IT CUMULATIVE OR CONCURRENT LIKE DOING TIME? If a proposal like this were to be suggested within the top OECD larger country's - the middle and lower class citizens would drag them out of their offices skin, bone, and filet them and barbecue them in public. This is something of a statement coming from Key who's in the top 100 richest Kiwi's and his mates who make up the ranks of the remainder. Very RICH proposal indeed! Its about marginal tax rates though Bomber and the incentive to earn more. The marginal tax rate isnt 38% either in reality (or 39.2% when to take into account ACC - another tax) its more because Working for the families makes it so. Currently its not the "rich" who are paying the massive amounts of tax, its high ended salary and wage earners which happen to be the most mobile form earners and can leave NZ. 78% of NZ tax take is paid by 10%. Want to know what happens if that 10%, or 2% of that 10% leave NZ, not good. Also you are looking at only one item of the package. In summary there is allot more, a land tax (hits property investers), decrease in depreciation rates, removal of depreciation on buildings, changes to the thin cap rules amongst them. Most of the changes are aimed at collecting tax from the segments who are currently avoiding paying tax (especially rental properties) and using that to bring some intregrity back into the system by aligning the top rates. Your point with GST is however fair. Perhaps a tax free income level of say $10K should be considered in addition..."
The fact that $50k is higher than 79% of kiwis earn, is an indictment in itself! Parity with Australia - dream on! So why not simply raise the trust rate of tax Jeff? Why must we lower tax rates and increase gst in the hope that the wealthy won't put their money into trusts? Susan St John was part of the TWG. She is neither old nor a man. She might be rich, but who can define that? Answer: no one. Susan St John was added on as an after thought and wasn't present at all sessions. Michelle Harding from Treasury was present however. "raise the tax on trusts"
- trust income can be taxed two ways - in the trust at 33 cents as trustee income or as beneficiary income at the beneficiaries marginal tax rate. Raising the trust tax rate above the personal rate would simply send the income through the trust into the hands of the beneficiary to be taxed at their marginal rate. "So why not simply raise the trust rate of tax Jeff? Why must we lower tax rates and increase gst in the hope that the wealthy won't put their money into trusts?" Because then you structure by way of company (tax rate being 30% due to internation pressure and likely to go to 27% at some point if Australia goes through with lowering its tax rate). You can then strip the income out, and all you ahve to do is leave the country, which if you are comparing us with Australia whose tax rates are overall lower (until you get to $200k or so), pay rates higher doesnt seem like a bad idea. The key point is labour is mobile, and currently 10% are paying 78%, that is alarming because those 10% are the most mobile of New Zealander's. You could come to a compromise where by the top rates and trust rate were 33%. The smaller disparity takes away the incentive to try and channel funds through company structures (due to the increased issues of distributing those funds and likely requiring a "top up tax - unless not NZ resident". If the tax cuts are to be provided by the group who are being undertaxed (property investors primarily) then I fail to see the problem. Also if it is to be partly funded by GST and again lower income earners compensated, again fail to see the problem. You are opposed more than anyone to funding cuts, but our tax system is seriously broken. When only 50% of NZ top earners are paying the top rate, but a single income earner in a couple is on a decent but not amazing wage, something is messed up. 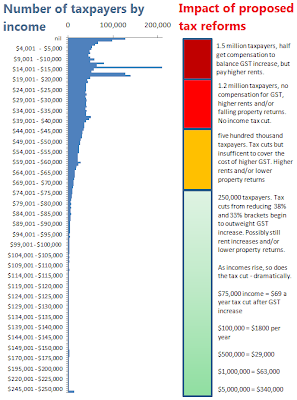 And finally, 40% tax (which is what it is really once you take into account ACC levy) is redicolously steap on everything over $70,000. It does discourage people working harder. FOR CASH UNDER THE TABLE RIGHT!